There is nothing less about paper and its use when it comes to academic study as we experience increasingly converging media spaces and functionalities of online applications within the screens of our laptops, mobile phones and tablet devices. The paper persists, and the paperless office, classroom and pedagogy become nothing but pure rhetoric. Hence, it is most pertinent to focus on paper and its “stickiness” in maintaining educational structures and practices. Usually hidden from view or neglected in educational technology studies is a consideration on how we think and interact not only with our mind but also with our heads and limbs. This paper will argue that paper has a composite place or bearing, a kind of stickiness to our technologised bodies, digital mobilities and hybrid practices in what I have coined here as papier-mach(in)e. This claim will be supported by evidence that demonstrates how we simply think both practically and pathically and that our mobilities in media and physical spaces are in one form or another meshed with paper. In fact, a drive towards a paperless classroom or pedagogy is without much foundation when it comes to mobilising a sustainable agenda for technology-enhanced learning. Enriquez‐Gibson, J. (2015). Papier-mach(in)e: Thinking with “sticky” paper in the cloud. 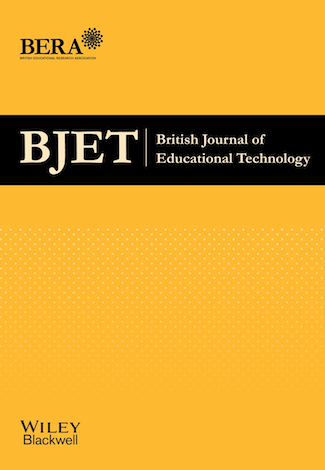 British Journal of Educational Technology, 46 (6), 1354-1366. Wiley. Retrieved April 25, 2019 from https://www.learntechlib.org/p/151946/.